Oil on paper mounted on panel. The naturalist painter Winslow Homer, who also experimented with Impressionism, became one of the most important chroniclers of the American Civil War (1861-1865). Homer’s works depict the lives of the soldiers during the conflict and of those who remained behind at home. In Waverly Oaks two women stroll between imposing oaks. The location, near Boston, became a regular visiting place for the city’s inhabitants and for a number of artists. The presence of women and children in this composition and other scenes of the period reflect the absence of men, who were engaged at the front. The lack of details and sketchy character of this painting have led various experts to suggest that it is unfinished and that it may in fact be a study. The interest in depicting a scene in a forest suggests the influence of the French landscape painters of the Barbizon School whose work Homer encountered in Boston and subsequently in France. The painting career of the until then illustrator Winslow Homer began in 1859 when he moved from Boston to New York. He took easel painting lessons from the French-born landscape and genre artist Frederic Rondel and at the National Academy of Design in the nascent metropolis. 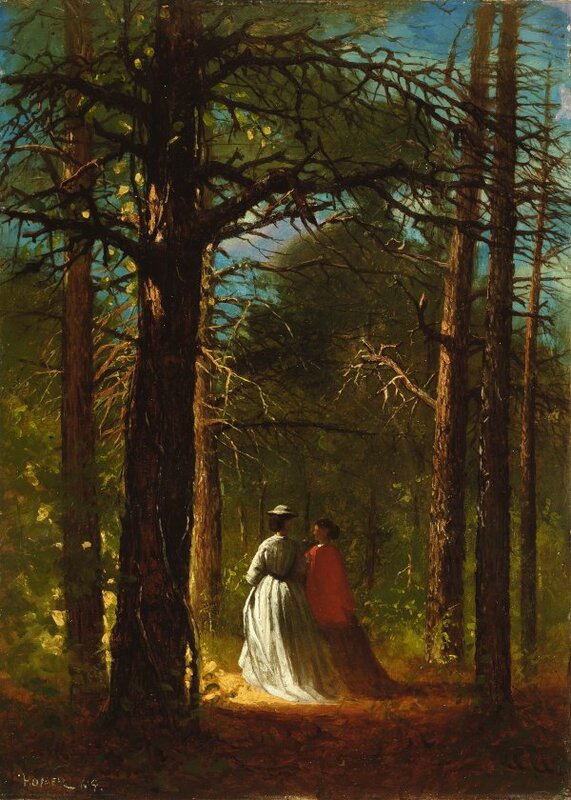 The Museo Thyssen-Bornemisza Waverly Oaks, dated 1864, is representative of this initial stage in which Winslow Homer began painting nature scenes with a completely personal style and developed an interest in studying the human figure and its relationship with the landscape. The Waverly Oaks park, famous for its century-old oak trees, was located between Waltham and Belmont, near Boston, and began to be frequented by nature lovers and a few plein air painters in the middle of the nineteenth century. In the centre of the composition, which is small in format but monumental in scale, two elegantly dressed women stroll through the park. Although, as in another work he painted that same year, The Initials, the positioning of the two small figures amid the marked verticals of the tree trunks could imply that they are dominated by nature, Homer affords his figures such a powerful presence that they have a monumental quality regardless of their size in the painting. Furthermore, as Lucretia H. Giese points out, these compositions, dated a year before the civil war ended, symbolise the absence of the combatants through female solitude. Despite its favourable reviews, the painting remained unsold. Katherine Manthorne, citing Goodrich and basing her conclusion on the letter Homer sent to Charles Vorhees from Paris offering him Waverly Oaks for a hundred dollars, deduced that his friend would have acquired it shortly afterwards. The recently published catalogue raisonné of the painter’s work explains that the work Vorhees finally purchased was A Game of Croquet and that the whereabouts of Waverly Oaks remained unknown for several decades.